Hints Everywhere … Dance IS a Sport! We at The Gabriella Foundation know full well that dance is a sport. And we see hints everywhere that major corporations and events are starting to agree. We agree. Our award-winning Everybody Dance! 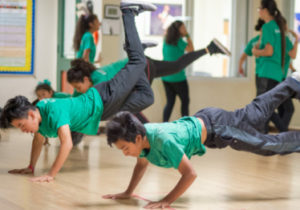 program offers weekly, very popular break-dancing classes to youth ages 8 and up – the stamina, agility and discipline our students demonstrate is mind-blowing. Of course, so is that of our ballet, tap, modern and hip-hop students, but I guess these dance forms will have to be for another Olympics. It demands crazy stamina: Dancers must have the stamina to make it through a performance without showing the audience how hard they’re breathing. It’s super competitive: Competitive dance is huge these days and dancers are also in constant competition for jobs and roles. It shapes our bodies: You can easily pick out a dancer’s body in a crowd. It makes stretching a must: Not stretching is not an option to perform at one’s best. It emphasizes strength: Have you ever seen a break dancer do a hand hop? Enough said. It often leads to serious injuries: With all of the crazy footwork and demand for flexibility, dancers get injured just as much as, if not more than, athletes. It requires the best equipment: Pointe shoes must fit a dancer perfectly, and they’re not cheap! Uniforms might be required: Our students are required to wear certain leotards, tights, and t-shirts to class, which promote unity and help them feel more connected. It takes years of training: Like professional athletes, pursuing a professional dance career takes years of practice, determination and drive. Finally, let’s get scientific. Penn State’s SC200! Science in Our World blog sites a study in the Journal of Strength and Conditioning Research, which found that professional dancers have similar or greater aerobic capacity, muscular endurance, flexibility, and agility when compared to athletes participating in high-intensity interval training.